Over the summer the Jeff Vinik-funded transit tax hike initiative did not want the school tax on the November ballot. They magically leap frogged over the school to ensure they got their performance audit completed by the required deadline. The Vinik-owned Times even viciously attacked the school board for wanting to put their tax hike on the same November ballot as the Vinik transit tax hike. Heat was put on billionaire Vinik and his billion dollar stadium ally Chuck Sykes who have contributed hundreds of thousands of dollars to the transit greed tax. So they donated to the school needs tax hike campaign. The Vinik bailed out Times did an abrupt about face and walked back their previous vicious attack on the school needs tax hike. When the Times got word the school needs and the transit greed tax hike campaigns were coming together, they quickly published an article trying to dismiss any problem with Hillsborough County having the highest sales tax rate in the state of 8.5 percent…and one of the highest in the country. 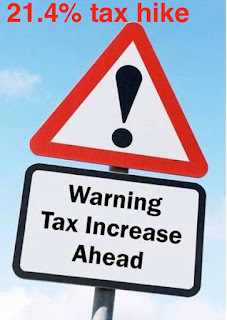 If both the need and greed tax hikes pass, Hillsborough County will have the same sales tax rate as San Francisco, CA. The Times ignores that sales tax hikes raises rental and lease rates which can be a double whammy to those most vulnerable and the low income who rent or lease. And why did the Times misrepresent the total revenue the transit tax would raise over it’s 30-year life? The Times knows the transit greed tax is 30 years yet they state the transit tax will raise $8 Billion over 20 years – irrelevant and erroneous information for a 30-year tax. Such silly little details…..that voters and taxpayers don’t need to know…. The 10-year one half percent school needs tax hike is probably polling better than the 30 year one percent Vinik transit greed tax. That is not hard to understand. The school needs tax has specific needed projects the tax will fund and ends in 10 years. The Vinik transit greed tax includes no project list. It’s a bunch of mandated spending allocations with 5 pages of regulations wrapped around them so nothing can be changed or funds reallocated for 30 long years. With a week to go to Election Day, desperation starts to set in if polling is hovering around 50 percent and/or there is still a large number of undecideds. Undecideds most often break voting no. What then does one do? Vinik’s half-billionaire bankroll can buy off just about anyone. Without Vinik’s baksheesh, his greedy transit tax hike would not be on the ballot.Vinik has sunk at least $630K into the transit tax hike campaign. Money talks. Vinik can leverage his financial and campaign resources with the school needs tax hike campaign. In exchange, Vinik can try to ride the coat tails of the school tax he must know has a better chance of passing. According to this Times article, both tax hike campaigns came together for a joint campaign kum ba ya press conference Monday. 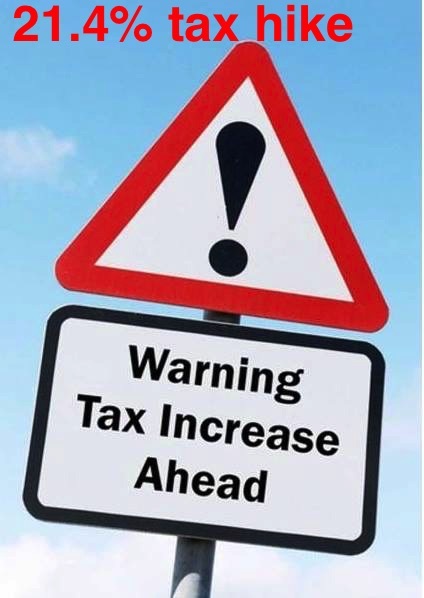 The campaigns of the transit greed tax and the school needs tax are now pushing to raise the sales tax rate in Hillsborough County from 7 percent to 8.5. It is official – it’s now a 21.4 percent sales tax hike on the ballot. Chuck Sykes, Hillsborough County School Board, Jeff Vinik, San Francisco Sales tax, Tampa Bay Times.